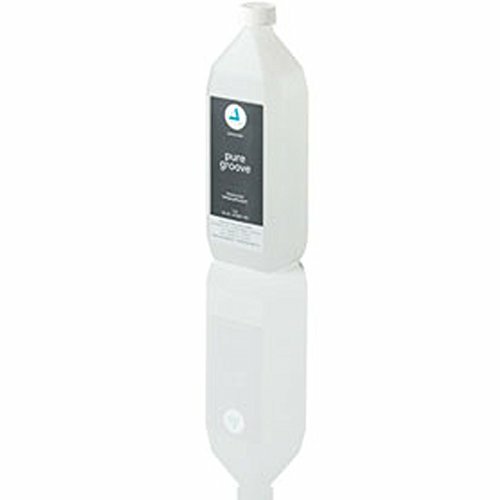 Clearaudio Pure Groove Zero is a powerful cleaning fluid developed specifically for use with Vinyl records and vintage 78rpm Shellac records. Shellac is easily dissolved by conventional vinyl cleaning fluids, so it is extremely important to only use fluids specifically designed for use on Shellac records. If the cleaning fluid is only used for Vinyl records, Ethanol can be added to receive better cleaning results. Mixing ration: 350 ml Pure Groove Zero = add 150 ml Ethanol 700 ml Pure Groove Zero = add 300 ml Ethanol 1.75 ml Pure Groove Zero = add 750 ml Ethanol 14 l Pure Groove Zero = add 6 l Ethanol Direction for use: For best results use Clearaudio Pure Groove Zero in combination with a Clearaudio record cleaning machine (for example Clearaudio Smart Matrix Professional Art. No. AC125, Clearaudio Double Matrix Professional Sonic Art. No. AC141). 1. Use with Clearaudio-Record cleaning machine Apply a small amount of Pure Groove Zero to the record's surface and spread it across the surface using a cleaning brush (for example Clearaudio Pure Groove Brush Art. No. AC015). Make sure that a continuous film of fluid is created across the entire playing surface, but avoiding the record label. Let the record revolve for approximately 30 seconds holding the cleaning brush gently against the surface so that a small "bow-wave" is created in front of the brush. The turbulence within the bow-wave will clean deep into the record's groove. After approximately 30 seconds, push "VACUUM" until the record is dry. In certain cases where the record is extremely dirty a second application may be necessary. Clearaudio Pure Groove Zero is a powerful cleaning fluid developed specifically for use with Vinyl records and vintage 78rpm Shellac records. Shellac is easily dissolved by conventional vinyl cleaning fluids, so it is extremely important to only use fluids specifically designed for use on Shellac records. If the cleaning fluid is only used for Vinyl records, Ethanol can be added to receive better cleaning results. Direction for use: For best results use Clearaudio Pure Groove Zero in combination with a Clearaudio record cleaning machine (for example Clearaudio Smart Matrix Professional Art. No. AC125, Clearaudio Double Matrix Professional Sonic Art. No. AC141). Use with Clearaudio-Record cleaning machine: Apply a small amount of Pure Groove Zero to the record's surface and spread it across the surface using a cleaning brush (for example Clearaudio Pure Groove Brush Art. No. AC015). Make sure that a continuous film of fluid is created across the entire playing surface, but avoiding the record label. Use without record cleaning machine: If using without a record cleaning machine, follow the above steps while the LP rotate on your turntable, but after cleaning with Pure Groove Zero, gently wipe the record with a lint-free cloth to remove as much of the dirty cleaning fluid as possible. Reapply and repeat this process to remove more of the soiled fluid the finally rinse with clean distilled water and place in a dish rack to dry thoroughly before play. If you have any questions about this product by Clearaudio, contact us by completing and submitting the form below. If you are looking for a specif part number, please include it with your message.